The Sergeant Bluff Industrial Park is located in Sergeant Bluff, Iowa, which is centrally located within the Midwestern region of North America and just minutes away from the Sioux Gateway Airport. The park offers abundant land, water and energy resources as well as a strategic location near highways and rail lines. 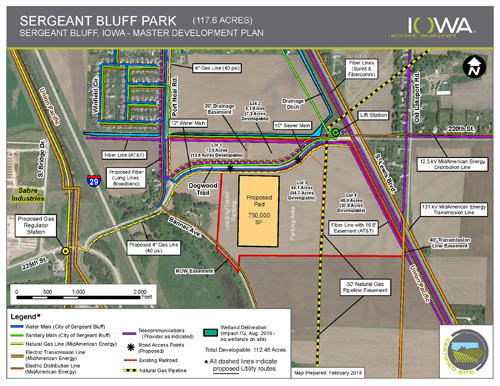 Sergeant Bluff Industrial Park is officially listed by the State of Iowa Economic Development Authority as a Certified Site, with a General Industrial classification. This means that it is ready for immediate development with a wide variety of targeted industries. Being a Certified Site, you can be assured that your project can begin promptly and proceed smoothly with existing access to resources and infrastructure. This location is easily accessible to major cities such as Chicago, Kansas City, Omaha, Minneapolis and Denver. The park’s location immediately adjacent to I-29 allows for easy access to one of the major north-south shipping routes for trade between the United States, Canada, and Mexico. East-west transportation routes are also available via I-80 and I-90, and Highway 20 is just minutes away featuring a four-lane highway with easterly transportation routes as well. Businesses that rely on transportation will find Sergeant Bluff Industrial Park to be both an ideal central location along with the strong Mid-Western Work Ethics and Values quality employers demand. 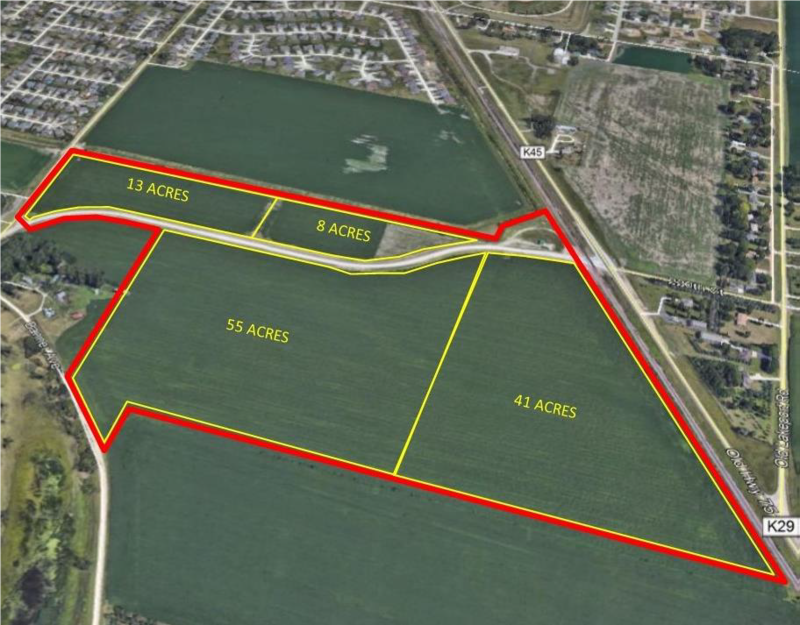 The Sergeant Bluff Industrial Park consist of over 117 acres of available property which can be sub-divided as necessary, into any size parcel to fit your business needs. The land itself is very flat, so minimal site preparation work will be required. Phase one geotechnical reports and wetlands review have been completed as part of the certification process. Existing infrastructure includes access to water, sanitary sewer, electricity and natural gas. All land within the park is zoned as Light Industrial - Light Manufacturing and can accommodate a wide variety of industries. MidAmerican Energy is the electric provider for the Sergeant Bluff Industrial Park location. Currently there is 12.47 kV electric three-phase distribution line available with a rated capacity of 5 Megawatts that is available and ready for all your needs. MidAmerican will also provide the natural gas to the industrial site location. There is currently a 4 inch/40 psi line of service available, depending on your demand this could be increased to the level of 290 psi to meet all future needs. The City of Sergeant Bluff operates and maintains its own gravity sewer mains and lift stations serving sanitary sewer needs for the industrial park. Sergeant Bluffs sanitary lift station drives all the community’s wastewater 1,600 feet west to a large diameter forcemain. The forcemain connects directly into the City of Sioux City’s Wastewater Treatment Plant. The City of Sergeant Bluff currently will handle a total of 500,000 gpd in the Park. The site is zoned for Light Industrial - Light Manufacturing so it is suitable to a wide variety of industries and building types. Whether you need a distribution center, a manufacturing location, a food processing facility or any other type of industrial/manufacturing facility, Sergeant Bluff Industrial Park can accommodate your needs. Because the site is already properly zoned, there’s no "red tape" and your project can begin without delay. If speed, cooperative assistance and an immediate start appeal to you, welcome to Sergeant Bluff Industrial Park! Whether you are expanding, relocating, or just starting up, Sergeant Bluff, Iowa puts your enterprise in the heart of a dynamic, economically vibrant and business-friendly region. Iowa is one of the lowest cost states of doing business in the nation, so take advantage of that and move to Sergeant Bluff. It's why global tech leaders like Google, Facebook and Microsoft have invested billions over the last several years to expand in Iowa. A variety of incentives are available, so contact any of the individuals shown here and they will help your company assess the available opportunities. The City of Sergeant Bluff and the State of Iowa stand ready to assist you with your company’s project, and they will make it an easy decision!